Looking to add some edge to your wardrobe? This spike chic ear cuff will be your favorite go-to accessory. No piercings? Not a problem. This little beauty just slips on and off. Easily customized to fit your ear with just a gentle squeeze. Our gender neutral "gold" ear cuff with black spike has been expertly hand-cut and formed from pure copper. We then carefully brushed to a luscious shiny finish. The edges of the cuff have been carefully filed and smoothed for a comfortable fit. A hole was then pressed through the metal and smoothed to ensure there are no rough edges. 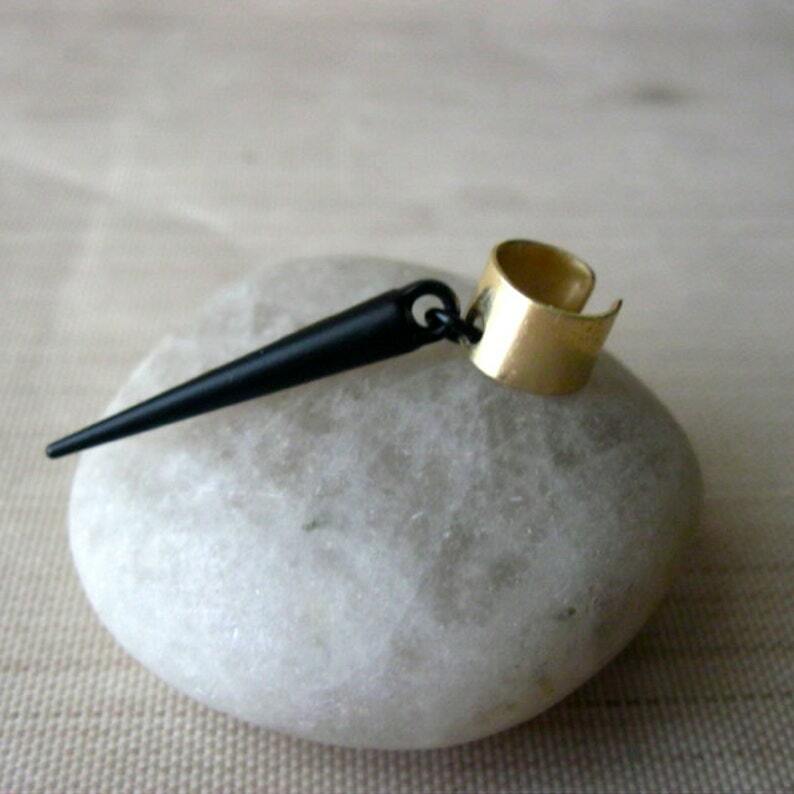 A heavy gauge jump ring has been used to attach a sleek black matte spike dangle. We quadrupled coat each cuff in spray-on industrial strength, hypoallergenic shellac coating. Please allow an extra few days for creation before shipping to allow the sealant to fully cure. The speckling you see in the photo is from the clear acrylic coating that is applied to prevent tarnishing. Over time the coating will wear off and the metal will begin to develop a patina. This is not a defect or flaw, but a natural process. If the developing patina is undesired, gently clean the metal with a copper polish and wipe clean. love it! Great quality and super Fast shipping. Very pleased with this item and seller! Love It! Thanks!